Had a go at jwm tweaking on arch, using Hoas arch repo for the mksh shell, cheers hoas. Indeed, our common savior Hoas is to be thanked for his initiative towards mksh. Nice done Steve! I like JWM+tint2 combination. Just another keep it simple within all possibilities. Using Linux with 4GB or 16GB MEM is the easiest thing today. ...But making Linux x64 distro runs below 200MB it's more good feeling in my opinion. @ Nili, cheers. Yes it is a good feeling having a system running under 200 megs, although there is a few quirky things i dislike about jwm overall its a good window manager. ^ and another fine pup! btw seems scrot.moe is down/broken at the moment? (no pictures; incomplete website access) It seems to concern only Germany. I wrote a PM yesterday at mrneilypops. ^ /me too. No images, and 504 bad gateway stuff. Seems to be working now, great! Thank you very much! It's all right now! 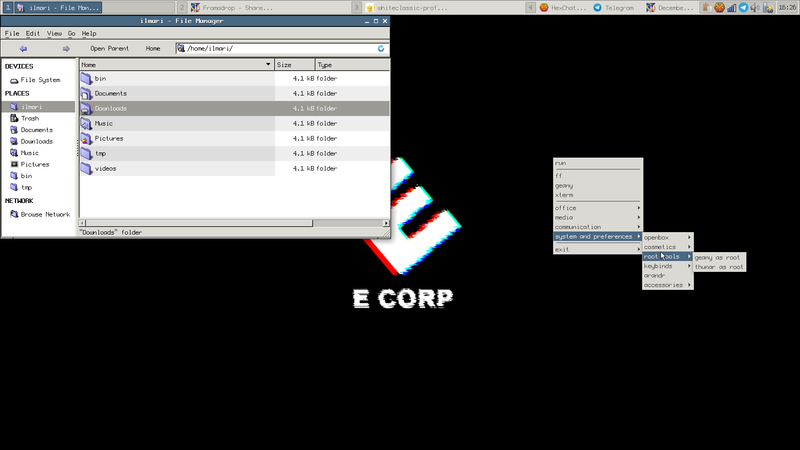 siduction with the conky1.10 (including Lua bindings) from @easysid. ^Thanks all for the feedback. The problem was an IP issue between host and CDN. CDN has been enabled again on scrot.moe. Long time bl and c! user first time poster. Fresh install on a laptop, cobbled together a tint2rc and some mac os 9 icons for a good beige look. I like to build the UI around raleigh as it has in my opinion aged gracefully. @satellite03: Love that retro style! Very nice! ^ nice; view from the new pier in your back yard? When did asciiquarium get colours? that build is actually broken, testing is fun.